Boucher Brothers is your one stop shop for all things beach! 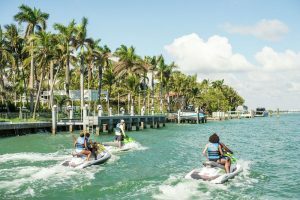 Channel your inner DJ Khaled, and tour Miami Beach at 60 mph on a jet ski. You can join us for a tour and see where the Heat play or just ride the waves solo. We have eight water sport locations all equipped with top of the line vehicles. No gym? 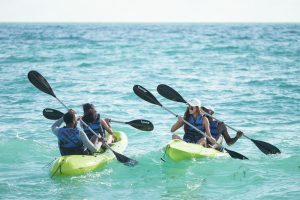 No problem… Come work on your bikini body while exploring the sea. Not only is it a great work out but it is a ton of fun for both kids and adults. Fly like an eagle over the sea. 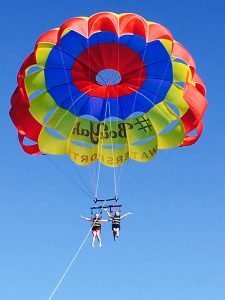 You’ll get an exhilarating birds eye view of South Beach during your parasailing trip. Captain Dan is ready to take you out and up. All reservations can be made by calling (305) 266-4144. From Fontainebleau to the Confidante there is no shortage of mouthwatering food & drinks on the beach. Enjoy seaside food and beverage service from the comfort of your lounge chair. 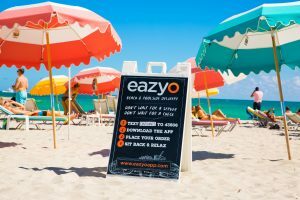 You can even order with a click of a button using the EazyO app. Lounge in Luxury on a day bed or hang out pool side in your own private cabana. We have lounge chairs and umbrellas for you and yours from sun up to sun down. Enjoy the sun on your skin and the sand on your toes because you deserve it!